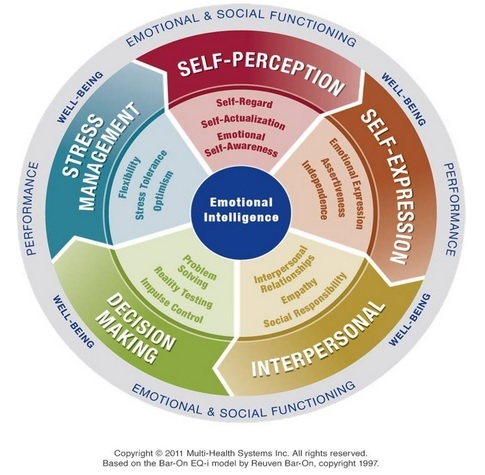 The Emotional Quotient Inventory 2.0® (EQ-i 2.0®) measures an individual’s emotional intelligence. Emotional Intelligence is proven to be a key indicator of human performance and development. People higher in EI communicate effectively, form strong relationships, and create powerful coping strategies. EI can be measured — more accessibly and less controversially than IQ — and unlike IQ, it can be substantially strengthened and developed. The Emotional Quotient Inventory 2.0 (EQ-i 2.0®) gives a snapshot of an individual’s level of emotional intelligence (EI) using one total score, five composite scores and specific subscale scores as per demonstrated by the EQ-i 2.0® Model based on the Bar-On EQ-i® model by Reuven Bar-On. Why use the EQ-i 2.0®? Measure distinct aspects of the emotional and social functioning of an individual and generate multi-level results; a total score of EI, five composite scores, 15 subscale scores and a well-being indicator score. Gain insight and a deeper understanding of how the results affect an individual’s workplace performance (e.g. conflict resolution, change management, teamwork, decision-making and more) with strategies customized based on individual results. Make instant connections between subscales and help participants leverage EI strengths and improve EI weaknesses. Use the Well-Being Indicator to measure your client’s level of happiness; resulting in additional developmental opportunities. Target solutions at every level with a multi-level approach to developing EI. Reports are designed with clear instructions, interpretation guidelines and results-driven content setting you up for success. Reliability and validity are important concepts to evaluate when selecting a psychological assessment for use in your organization. INTERNAL CONSISTENCY— Refers to how well all the items of a certain scale measure the same idea. TEST-RETEST— Refers to how well the assessment can produce the same results over time for the same person. Overall, the EQ-i 2.0® exhibits strong reliability, both in terms of internal consistency and test-retest. Has a structure that is dependable and applicable to a wide variety of contexts (e.g., development, coaching, leadership, etc.). Knowing that the EQ-i 2.0® accurately measures EI, your development efforts will have meaningful impact on increasing EI and related outcomes (e.g., job performance, leadership competencies, intrapersonal skills, etc.). The EQ-i 2.0® is now included in the Nineteenth Buros Mental Measurements Yearbook (MMY), published in 2014 and widely considered an important marker of proper test development. The inclusion of the EQ-i 2.0® in the Buros MMY and its positive review is an important milestone for the assessment and acknowledges the scientific rigour and effort that MHS has put into its development. Focuses on the impact of emotional intelligence at work and offers suggestions for working with colleagues, supervisors, and clients in a variety of coaching development and work setting. For recruiting, this report is useful when using scores to guide the selection of the follow-up interviews questions, and for identifying potential training and development needs. Examines the EQ-i 2.0® results through four key dimensions of leadership: Authenticity, Coaching, Insight and Innovation. As an option, compare the client results against those of top leaders, creating a coaching benchmark for exceptional EI performance. The leadership report also contains insights on the leadership and organizational implications of client results, as well as strategies for development aimed to help clients reach their true leadership potential. Combines the scores of individuals in a manner that will allow for interpretations to be a mage at the group level. An overview of group results is presented to assist with identifying group strengths as well as the areas where the group as a whole is still in need of improvement. The organizational implications of a group’s emotional intelligence score is presented and strategies for action are recommended to further develop the group’s potential. You would like to get certified ?